The greatest criticism of the Olympus E-P1, E-P2 and E-PL1 has undoubtedly been their autofocus speed. But a new firmware update increases AF speeds across these models by a promised minimum of 15%—that's using any lens you like. CENTER VALLEY, Pa., April 15, 2010 – Olympus today announces the release of new firmware that improves auto focus performance for still images and high-definition (HD) video recording for the Olympus PEN E-P1, E-P2 and E-PL1 cameras. The firmware update will also enable the menu and recorded image to be displayed on the E-P2 and E-PL1 LCD while the VF-2 electronic viewfinder is in use. The firmware update improves the autofocus speed for the E-P1, E-P2 and E-PL1's still image capture with all Four Thirds and Micro Four Thirds lenses. In addition, the update improves auto focus tracking in continuous auto focus (C-AF) mode when shooting movies and using the new M. Zuiko Digital™ ED 9-18mm F4.0-5.6 and M. Zuiko Digital ED 14-150mm F4.0-5.6 lenses. These lenses are Olympus' first movie and still [picture] compatible (MSC) lenses and are optimized to achieve accurate and silent auto focus while shooting HD videos. "This firmware update makes the popular PEN series cameras even more functional for photo enthusiasts and movie-makers alike," said John Knaur, senior marketing manager, PEN & E-System, Olympus Imaging America Inc. "The improved auto focus speed will make it even easier to capture outstanding, high-quality images and HD videos." 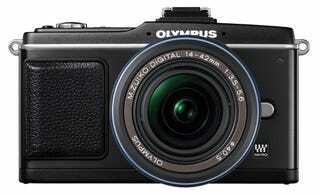 The new firmware will be available on Olympus' Web site starting on April 22, 2010. Click on the following link to learn more about the update and gain access to the firmware updater application: http://www.getolympus.com/penupdate. The M. Zuiko Digital ED 9-18mm F4.0-5.6 lens will be available in May 2010, and the M. Zuiko Digital ED 14-150mm F4.0-5.6 lens will be available in June 2010.